Most business models function in a linear fashion, in which products are manufactured, used, and then disposed of. In recent decades, however, there has been a push to find more sustainable practices that reuse products instead of disposing of them in landfills. From this, the concept of the circular economy was formed. As a material used globally in millions of parts, buildings, and products, steel plays a central role in helping build and sustain a more sustainable, circular economy. The circular economy concept gained momentum in the 1970s as academics, businesses, and thought leaders realized that there needed to be a change in the way products were manufactured and disposed of. The general goals of a circular economy involved eliminating waste, using renewable energy to manufacture goods, and to be more respectful of the natural environment. In a circular economy, resources need to be allocated efficiently while making products that earn a return for the businesses without being too costly to consumers. Products should be durable, recyclable, and easily repaired. Simply put, manufacturers and consumers need to extend the life of their products before they are thrown away. A well functioning circular economy ensures that products retain value even at the end of their use stage. Ideally, products would be-be 100% recyclable, and even before reaching that stage, they should be durable enough for reuse or remanufacturing. Steel represents a critical piece of this concept as it can be reused, repurposed, and remanufactured after use and then still remains infinitely recyclable. Beyond that, advances in steel production technology have created more energy efficient and green processes for steelmakers. Steel is used to manufacture and ship almost every product on the globe. Its ubiquity makes it a central piece of the concept of a circular economy and more sustainable production. It can be reused, remanufactured, and recycled without losing any of its properties. Also, due to technological advancements in recent decades, steel has become both lighter and stronger making everything from cars to ships more energy efficient. 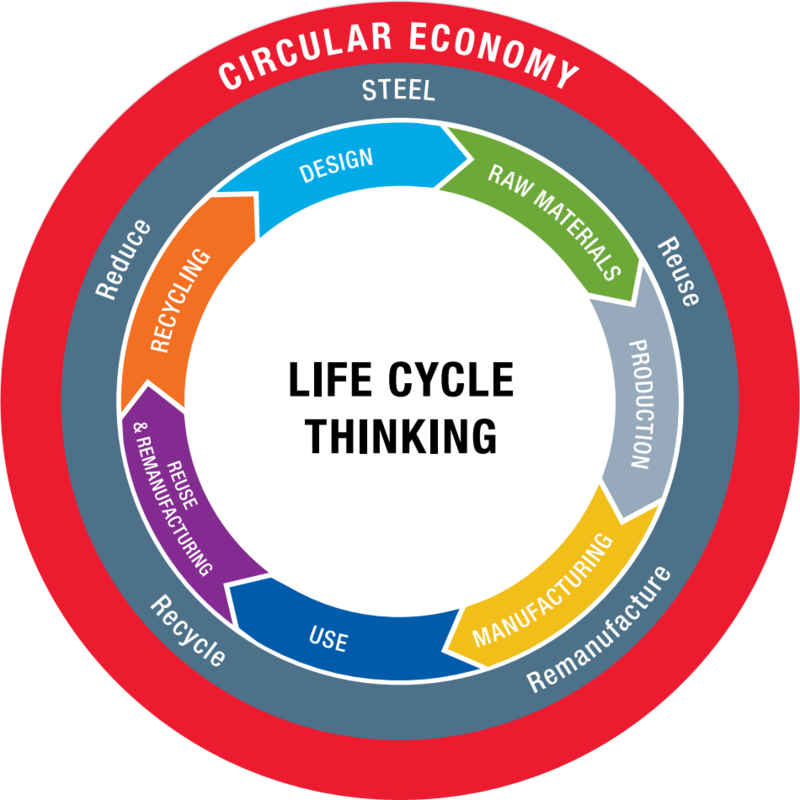 In addition to lightweighting, one must look at steel’s life cycle assessment in order to measure its effect on the circular economy, Last month on The Steel Wire, Dr. Roland Geyer from the University of California at Santa Barbara took an in-depth look at the life cycle assessment of steel. His research aims to show that steel’s benefit to the automotive industry lies not only in its lightweight properties but also in its ability to be recycled and used over and over again – making it the most optimal material for automakers in a circular economy. For its part in the circular economy, POSCO has been pursuing advancements in sustainable steel production from multiple angles. To reduce greenhouse gas emissions, POSCO helped develop the FINEX® process. It is based on the direct use of iron ore fines and non-coking coal while eliminating the coke-making and sintering processes, which are most critical to the conventional blast furnace process. Combining these two decisive advantages led to lower production costs and a reduction of environmental emissions in comparison with the conventional blast furnace route. For automakers, the steel used to manufacture vehicles is critical to the circular economy in both its production and use. POSCO has been at work developing new automotive steel solutions that are lighter, stronger, and more affordable. They have also begun utilizing advanced AI and IIoT (internet of things) solutions in its automotive steel plants to reduce waste. Because POSCO GIGA STEEL is lightweight, strong, and affordable, it is the ideal material option for automakers looking to build more sustainable vehicles. For its manganese steel production, POSCO developed new technology that cut production time in half while increasing efficiency by 10%. Now, instead of melting the iron, lowering the temperature, and then melting it again, POSCO can store the molten iron at its new PosLM facility helping to reduce energy costs and shorten production time. In order to move toward a circular economy, businesses and industries must make fundamental changes to how their products are manufactured and used. Steel remains a critical piece of this concept as it can be reused, remanufactured, and recycled. However, more needs to be done, and companies like POSCO are taking the lead to develop more sustainable production processes.